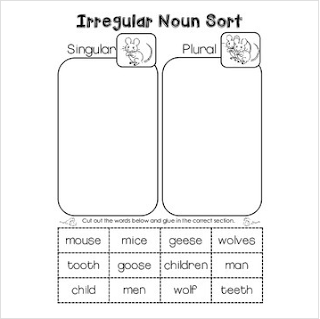 Irregular plural nouns cut and paste worksheet. I hope you enjoy this little freebie to help teach irregular plurals. I made this to go along with an Irregular Plurals packet that is in progress, but I decided to go ahead offer this as a separate freebie. I have lots of items in my TPT store to help with Speech Therapy goals or to supplement your ELA lessons.